Susanna Claire Potter made her entrance into the world on Monday, July 14 at 8:57pm, a mere 22 minutes after Mom and Dad got to the delivery room at CentraState Medical Center in Freehold, NJ. Susanna certainly gave the nurses something to talk about for a few days. She weighed in at 6 lbs. 13 oz and measured 18 inches long. 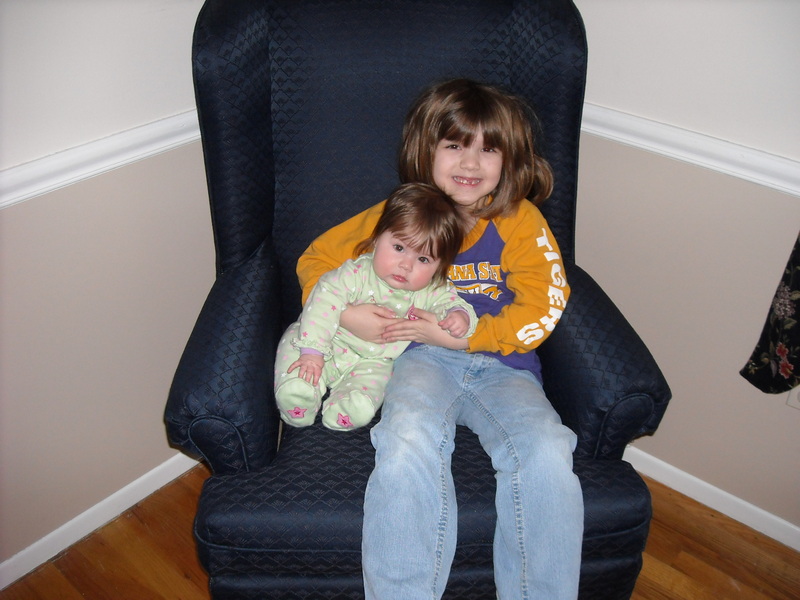 She was smaller and quicker than her older brother and sister, but had the same beautiful head of hair. She appears to be a good combination of features from her older siblings, not looking overly much like one or the other. At first look, she seems to have Rachael’s mouth and Liam’s eyes. Susanna’s weight dropped to 6lbs. 9oz. 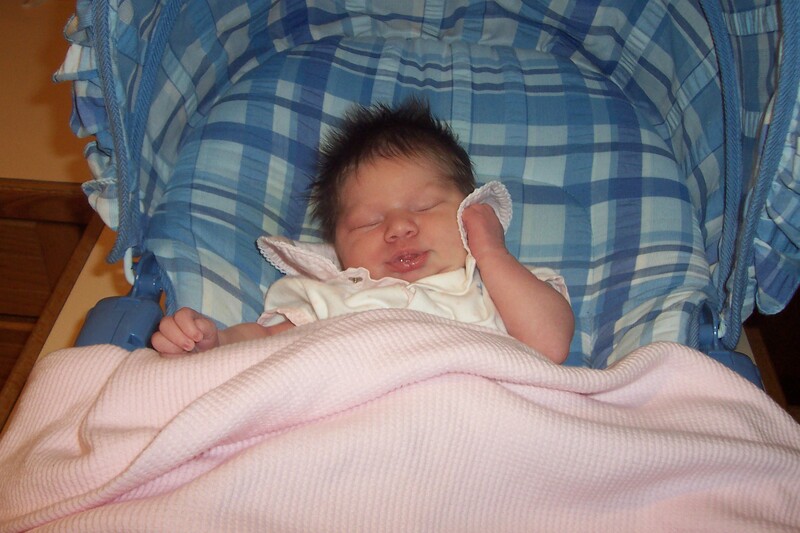 by the time she left the hospital, but she rebounded to 7lbs 3oz by her 1-week check-up. Rachael and Liam (and Grandma and Grandpa) came to see Susanna in the hospital—Liam was quite curious, but Rachael was a little timid. By the end of the month, however, both siblings seemed quite taken with their baby bundle of a sister. Liam likes to go up to her, rub her hair, and say, “Susa cute!! Hair soft!” Rachael enjoys holding her, until Susanna starts moving or making noise. In addition to meeting Grandma and Grandpa, Susanna also got to meet another set of grandparents, Maw-Maw and Pots. 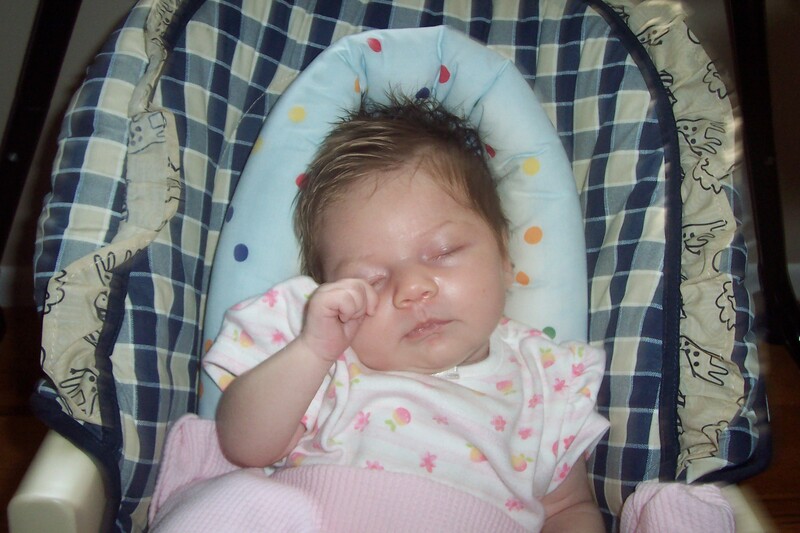 Susanna continues to thrive, staying awake more often during the day and sleeping a little bit longer at night. 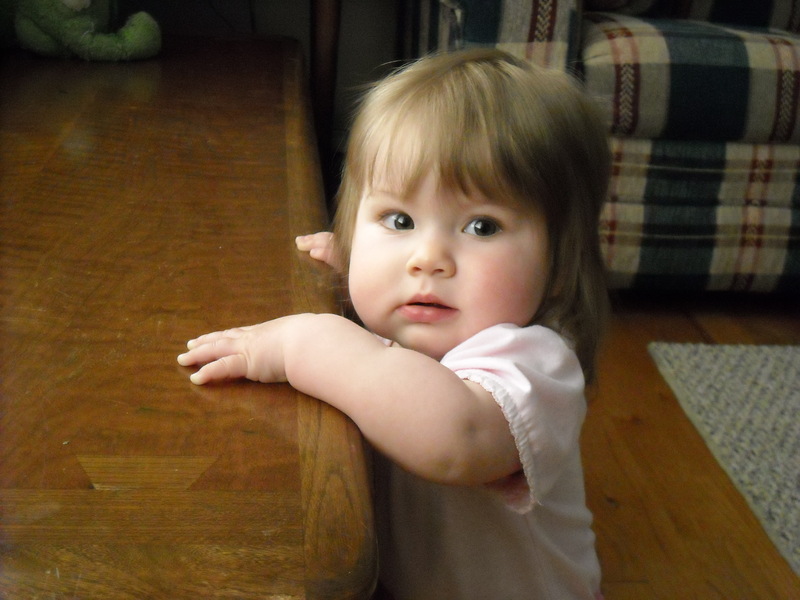 She is also beginning to be more aware of her surroundings, going cross-eyed as she tries to focus on things. 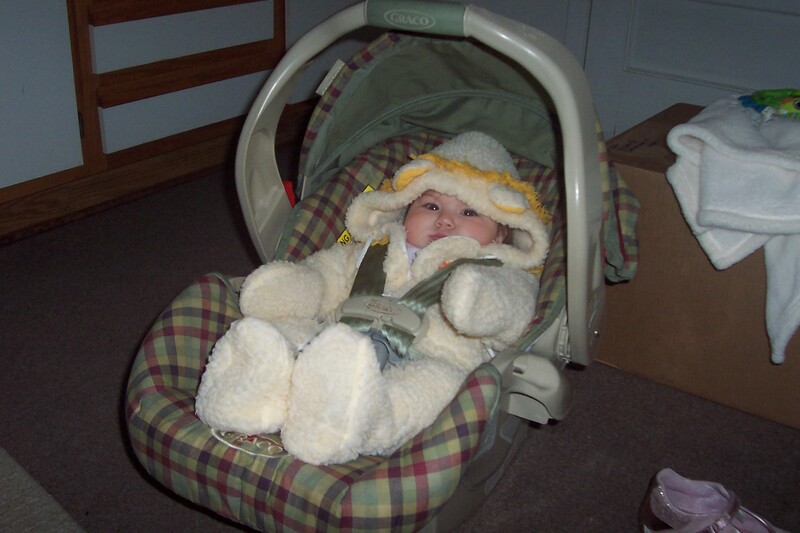 At her 1-month check-up, she weighed 9lbs 8oz and measured 21 inches—she grew 3 inches and almost 3 lbs in one month. Rachael and Liam don’t seem to be tired of her yet. It’s amazing, not just the amount of noise that Rachael and Liam can make, but the fact that Susanna can sleep through it. September 1st—Susanna sleeps through the night!! 2-month check-up: 11lbs 8oz, 22 ¼ inches. Susanna continues to grow rounder and she has started to laugh, mainly at Liam. We were sitting at the supper table, and Susanna was sitting on Mom’s lap when Liam did something goofy, and Susanna gave her first real giggle. It was a great sound. 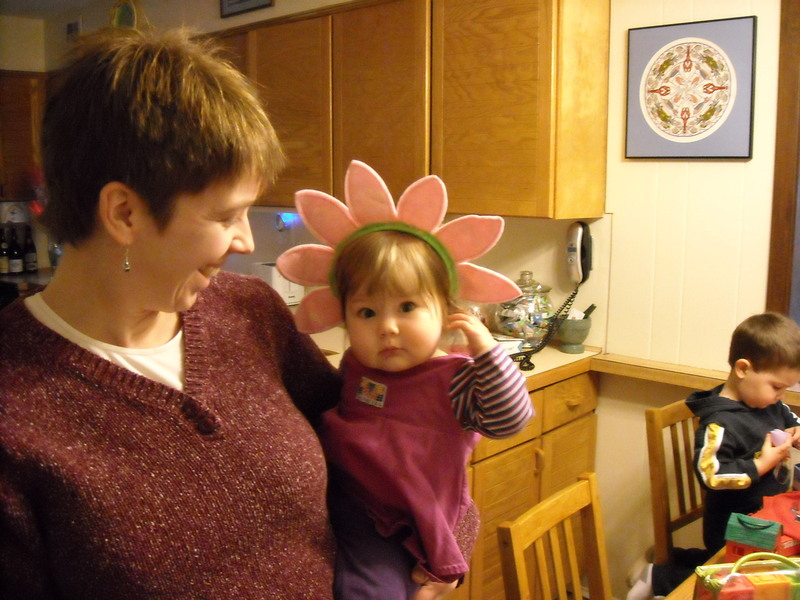 Susanna dressed up as a tiger for Halloween—the same costume the other two wore for their first Halloween. The costume will now be retired. 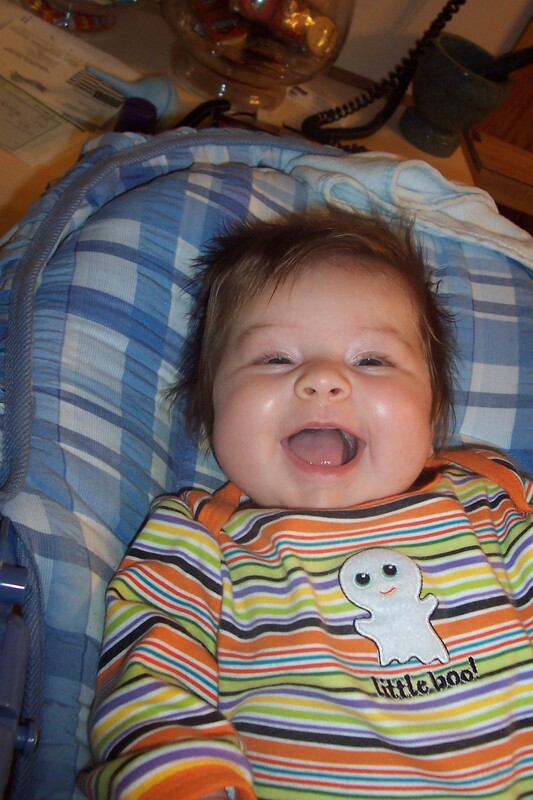 Susanna is a happy baby; she laughs and smiles a lot, and is very easy-going. She is making some attempts to roll over, but hasn’t quite mastered it yet. She did roll from her tummy to her back once, but we think it was a fluke and she didn’t really mean to do it. Susanna had her 4-month check-up and weighs 14 pounds 3 ounces (75th percentile) and is 24 ½ inches long (50th percentile). We had a great Thanksgiving, with Maw-Maw and Pots, Aunt Emily, Uncle John, and Cousin Travis all coming here. There was a lot of energy in this house, but it was nice to have family around. This was the first time Emily, John, and Travis met Susanna, and Aunt Emily probably would have held Susanna the whole time they were here had she been allowed to. Aunt Emily did try to feed Susanna her first bottle, but Susanna wouldn’t have any of it. We had to check Emily’s suitcase before she left to make sure she wasn’t trying to smuggle Susanna home with her. Susanna is trying so hard to roll over—we really thought she was going to manage it a few times. We can tell she very much wants to sit up—she tries very hard, especially in her bathtub. She has also become very interested in small toys and rattles that are offered to her. 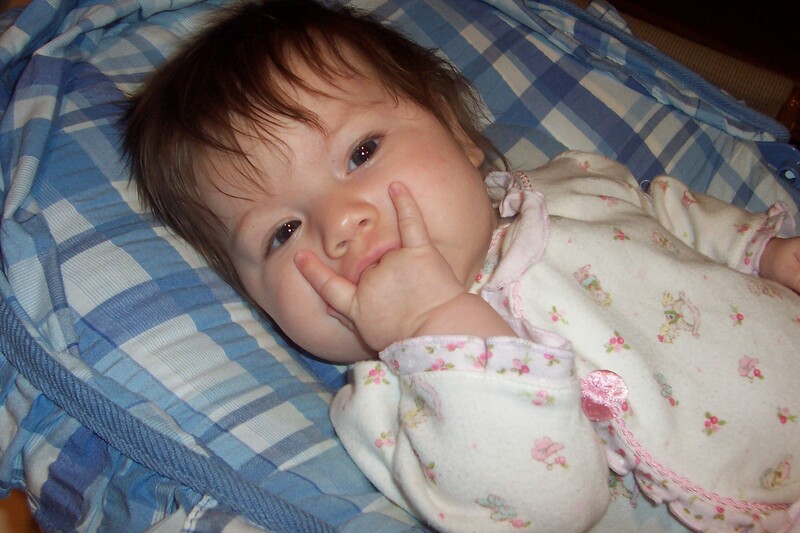 Susanna had no clue what was happening on her first Christmas. It was just another day to her, although she does seem to like a new rattle that Santa brought her that lights up and makes noise when she shakes it. 1/24—Susanna started rolling front to back. We started trying to give her some baby cereal, but she is just not interested in baby food. She is certainly not wasting away, so we aren’t concerned yet. She will get the hang of it eventually. She is so close to sitting up by herself. 2/8—Susanna now sits up by herself. At the end of February, she was so close to crawling. She will get up on her hands and knees, rock a little, then lunge in the direction she wants to go. She never actually moves her hands and knees, though. By the end of the month, she was also doing better at eating baby food. She still isn’t eating much, but she will tolerate a decent sized serving of oatmeal or a half jar of pears before she starts spewing it. Susanna is still a very happy baby, and tolerates her brother and sister very well. They know how to make her laugh, and Rachael seems to love being a big sister. Susanna has added bananas to her baby food diet. Her two center, bottom teeth have made an appearance—the right one on the 24th and the left one on the 31st. She is taking forever to crawl. She will still get up on her hands and knees but won’t move forward. Susanna loves her big brother, and he loves making her laugh. Susanna has a fairly wide variety of foods that she will eat now—oatmeal, pears, applesauce, peaches, bananas, sweet potatoes, carrots, squash. We are trying to work on small finger foods, but haven’t had a whole lot of luck. Even less luck with the sippy cup. 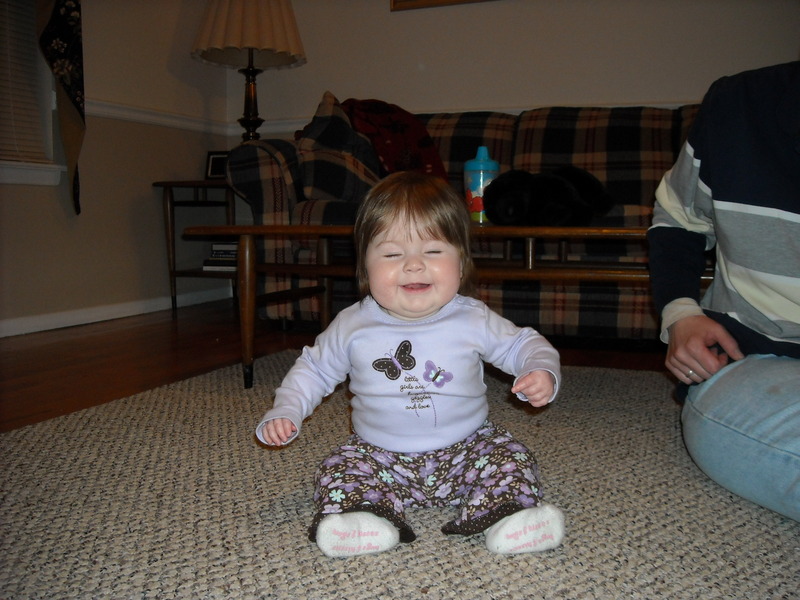 At her 9-month check-up Susanna weighed 18lbs. 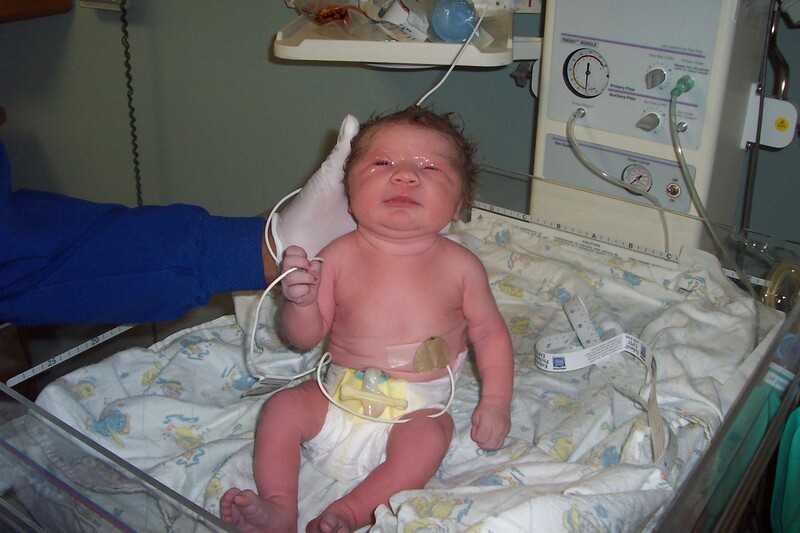 8oz and measured 27 ¼ inches. It appears she is going to have a large head like her brother. She has had a terrible time sleeping lately. We don’t know what the problem is, but we think it’s been a lot of different things: rolling over, teeth, ear infections, gas, and now just the habit of waking up at night. She gets more and more personality every day. No more teeth yet, but the two upper ones don’t look like they will take too much longer. Every day we think she is going to crawl. She will get up on her hands and knees and scoot her knees forward, will pick up one hand but will put it right back down. At the end of the month she actually started to pull up from her belly to her knees. We think she is going to walk before she crawls. May 6—Susanna is FINALLY up on her hands and knees and crawling! And pulling up to standing. Still no new teeth and still not sleeping. She like just about any baby food we give to her, but we are trying to add some table food too, but not with much success. Finally two new teeth this month. Susanna is finally realizing that table food can be more exciting than baby food. 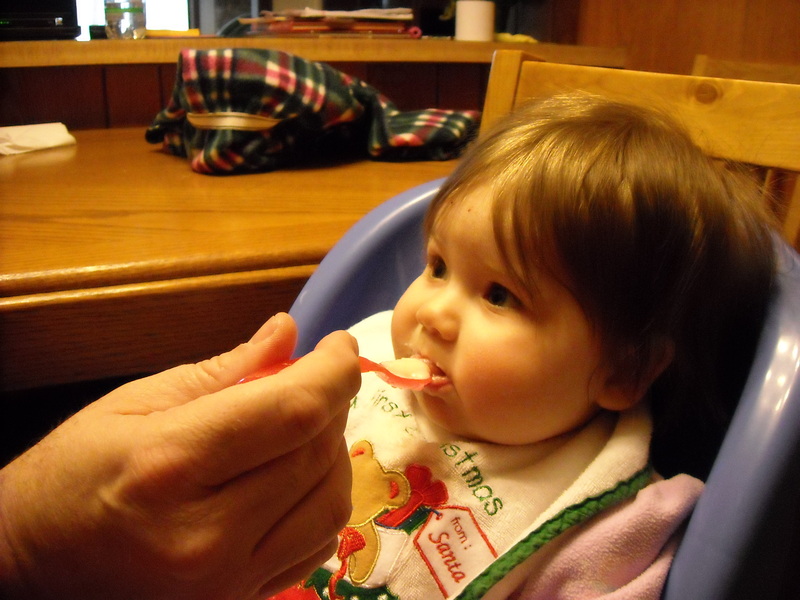 In fact, by the end of the month, she is pretty much done with baby food. She has taken to the sippy cup quite well, too.